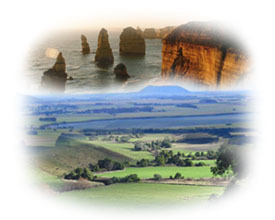 The Corangamite region has formed through landscape-building episodes over the past 600 million years (Ma), in a variety of environments ranging from deep sea sedimentation to explosive volcanoes. Landscapes continually evolve and processes such as earthquakes, landslides and even saline groundwater discharge, are manifestations of this evolutionary process. Landforms in the Corangamite Region.